Larry Young directs the Conte Center, whose goal is to improve social cognition in humans who have impaired social function. Emory University’s Yerkes National Primate Research Center and Brain Health Center have received a five-year, $12.7 million National Institute of Mental Health (NIMH) grant to continue innovative research on oxytocin, a brain chemical known for establishing mother-infant bonds, at the University’s Silvio O. Conte Center for Oxytocin and Social Cognition. The goal of the Conte Center research during the next five years is to use cutting-edge technologies, including CRISPR gene editing and optogenetics, in research with rodents and nonhuman primates to understand more precisely the way oxytocin acts in the brain, including its role in neural communication and social functioning. “We want to translate this knowledge to treatments to improve social functioning in disorders such as autism, schizophrenia and other psychiatric conditions,” says Larry Young, PhD, who will lead the Conte Center team, which includes researchers at Yerkes and Emory as well as the University of Arizona. Young is chief of the Division of Behavioral Neuroscience and Psychiatric Disorders at the Yerkes Research Center, director of the Center for Translational Social Neuroscience (CTSN) at Emory and professor of psychiatry in Emory’s School of Medicine. In addition to the focused research projects, the Silvio O. Conte Center for Oxytocin and Social Cognition will facilitate outreach activities to local schools and the Atlanta community. “With our continued funding, we will be able to further our work to determine how oxytocin functions and to share that information with colleagues and the public worldwide. We hope to harness the power of a mother’s love via the powerful bond her brain chemistry forges with her infant so we can better understand and boost the salience of social cues in people who have difficulty navigating the social world,” Young continues. Since its initial funding in 2013, researchers at Emory's Conte Center have worked with rodents, monkeys and humans, including those who have autism, to explore how normal brain chemistry involved in social bonding, such as between parent and offspring or between partners, affects specific brain communication and mental processing of social experiences. “The Conte Center team under Dr. Young’s leadership is performing world-class research on the biology of social bonding, which has tremendous implications for mental health and psychiatry,” says Mark Rapaport, MD, chair of Emory’s Department of Psychiatry and Behavioral Sciences. The Emory Conte Center renewal coincides with Young’s establishment of the Center for Social Neural Networks at the University of Tsukuba in Japan to foster international collaborations to understand the social brain in even greater detail. The new center significantly expands the reach of Young’s leadership and impact in the field of social neuroscience into Asia and involves faculty based at institutions across Japan. 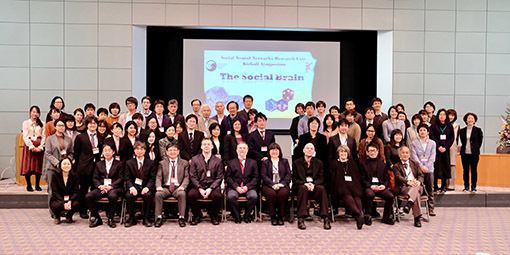 in Japan to foster international collaborations to understand the social brain. “I am very excited about the new center based at the University of Tsukuba, and I believe that with Dr. Young’s leadership, it will have a national impact on social neuroscience in Japan,” says Sonoko Ogawa, PhD, associate director of the center and a behavioral neuroscientist at the University of Tsukuba. Young will also mentor a research team at the University of Tsukuba exploring the precise brain circuits of social functioning using genetically engineered mice. During the past two decades, Young has built a strong network of colleagues across Japan, and the new center, the third Young has launched, will unify a diverse network into a synergistic team. In addition to the new Center for Social Neural Networks, the other two centers Young has launched are the Conte Center and the CTSN, which brings together basic and clinical scientists to translate understanding of the social brain into novel treatments for social deficits in psychiatric disorders, including autism. According to Young, the Center for Social Neural Networks will be the catalyst for new research and collaborations across Japan and around the world that will lead to remarkable progress in understanding the social brain and acting synergistically with the Emory centers. “I am very excited to have launched this collaborative center in Japan and am confident it will lead to exciting new research opportunities that will ultimately improve the quality of life for those who have impairments in social functioning,” he says. Young credits his current global leadership position to the support he has received from Yerkes and Emory during his 24-year research career at the university. His work to explore the neural mechanisms of social bonding in monogamous prairie voles has positioned Emory as a global center of excellence in social neuroscience and the quest for understanding the social brain. The Conte Center renewal is supported by the National Institutes of Mental Health of the National Institutes of Health under award number 1P50MH100023. Dedicated to discovering causes, preventions, treatments and cures, Yerkes National Primate Research Center (NPRC), part of Emory University’s Robert W. Woodruff Health Sciences Center, is fighting diseases and improving human health and lives worldwide. The center, one of only seven NPRCs the National Institutes of Health (NIH) funds, is supported by $79.1 million in research funding (all sources, fiscal year 2017). 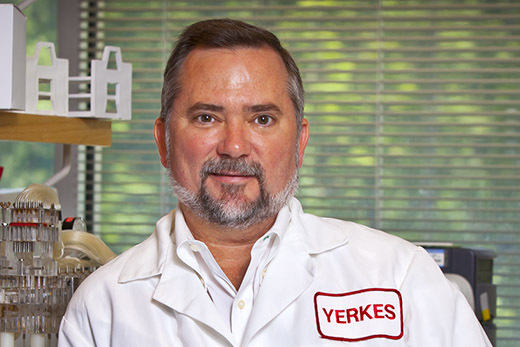 Yerkes researchers are making landmark discoveries in microbiology and immunology; neurologic diseases; neuropharmacology; behavioral, cognitive, and developmental neuroscience; and psychiatric disorders. Since 1984, the center has been fully accredited by the Association for Assessment and Accreditation of Laboratory Animal Care International, regarded as the gold seal of approval for laboratory animal care.